What’s orange and black and fun all over? Halloween at Third Place Commons, of course, where the festivities start Saturday, Oct. 28th at 2PM with the first of three family-friendly events. The 7th annual Halloween Hafla is a lively, colorful, Halloween-themed belly dance show that will delight and surprise one and all. Then, don’t go far because at 7:30 it’s time for our big Halloween Dance Party, which has become a beloved annual tradition at the Commons. This year we welcome Commons favorites Rainy City Riff Raff who will thrill the crowd with their creepy costumes as well as their roof-shaking, soulful renditions of more popular tunes than you can wave a witch’s broom at. It will be a night of magical music that’s sure to spook you out and get your feet moving at the same time! Feeling in the Halloween spirit? Be sure to wear your costume and join in the just-for-fun Costume Contest. There will be silly prizes, and more importantly bragging rights, on the line so wear your scariest, goofiest, or cleverest duds for the occasion. Whether you opt to come in costume or come as you are, you won’t want to miss this ghoulishly good time at our haunted hootenanny, so grab the whole family and head to the Commons. The show starts at 7:30PM on Saturday night and all are welcome! Finally, the Halloween festivities end in a grand finale on Tuesday, October 31st – Halloween night. 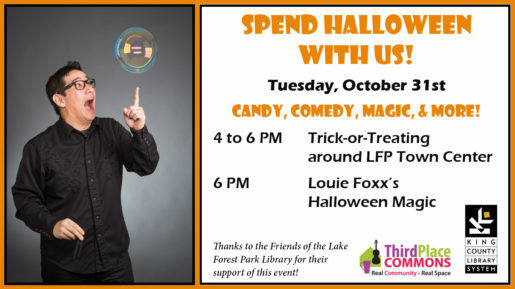 Highlights include trick-or-treating for costumed kiddos across Lake Forest Park Town Center along with creepy coloring & crafts from 4 to 6 PM, followed by a Halloween show by magician & entertainer Louie Foxx at 6PM. Known as the “one-man side show,” Louie Foxx has appeared on everything from New Day Northwest to America’s Got Talent and received rave reviews each time. Louie will be serving up magic, comedy, cowboy tricks, and more, plus some special Halloween surprises that are guaranteed to entertain kids of all ages! Halloween at the Commons featuring Louie Foxx is sponsored in part by the good folks at the Friends of the Lake Forest Park Library, so thanks to them for making this fantastic, family event possible. 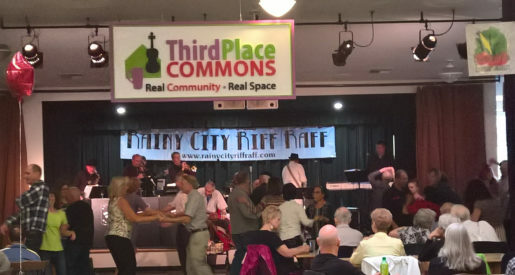 And remember that events at Third Place Commons are always free and open to everyone, so join in the fun!